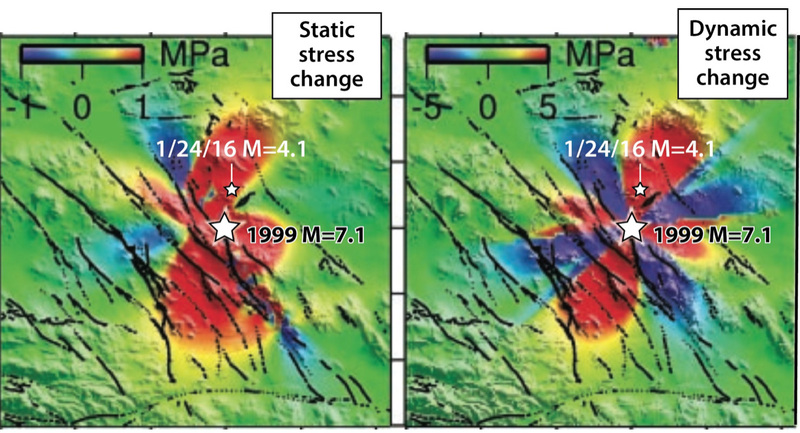 The stress imparted by the 1999 M=7.1 Hector Mine, CA, rupture brought the site of the 24 Jan 2016 M=4.1 quake closer to failure. The permanent or ‘static’ Coulomb stress change is shown at left, and the peak dynamic stress carried by the seismic waves is shown at right. 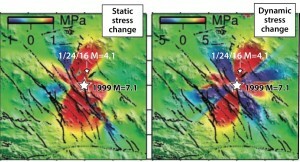 The dynamic stresses are 5-10 times larger at the site of the M=4.1 event than the static stresses, but they lasted about a minute 17 years ago, whereas the static stresses do not diminish, and so likely continue to exert an influence on seismicity. (1 MPa is about 1/4 the typical car tire pressure; 5 MPa is about the pressure in a bicycle tire). Figure modified from Yuri Fialko, David Sandwell, Duncan Agnew, Mark Simons, Peter Shearer, and Jean-Bernard Minster (Science, 2002).